Long Beach State belted out 10 runs while taking the series from UC Irvine and moved one step closer to a potential NCAA Tournament bid in a 10-1 victory. Richard Prigatano and Ino Patron paced the offense with two hits and two RBIs a piece including a double and triple respectively. Colton Vaughn also added two knocks and Johnny Bekakis, Michael Hill, Zack Belanger and Eric Hutting each backed the Long Beach State scoring machine. It may have been Friday night in most places, but it was "Frye" Day Night at Blair Field. Dirtbags starting pitcher Josh Frye improved to 8-0 as a starter by delivering a solid eight innings of work while scattering six hits and only one run. 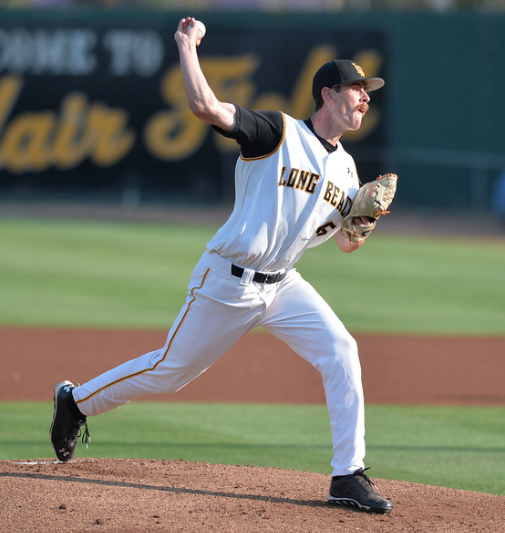 The local product out of Millikan High School also lowered his ERA to 1.51 and with the win, Long Beach State is 9-0 in games in which he has started. Long Beach State (31-24, 16-7) wasted no time in getting to Anteaters starting pitcher Elliot Surrey. Garrett Hampson and Patron recorded back-to-back singles before the red-hot Richard Prigatano doubled home both of them to make it 2-0 Dirtbags. Johnny Bekakis then scorched a line drive that clanked off of UC Irvine shortstop Chris Rabago's glove to score Prigatano while stretching the lead to 3-0. It would end up being all that the Dirtbags would need in securing this huge series victory. They scored in every inning except the 3rd and the 6th and tallied their second double-digit scoring effort in three games. UC Irvine (35-21, 15-8) scored their lone run of the ballgame in the top of 2nd when Ryan Cooper grounded to second base scoring Jonathan Munoz following a hit batsman, single and sacrifice bunt. However, Long Beach State quickly erased any glimmer of hope that the Anteaters had in getting back in the game when Patron tripled home Colton Vaughn to make it 4-1 Dirtbags. With the win, Long Beach State has now won eight of their last nine games and further strengthens their case for getting to the NCAA Tournament, a place that the Dirtbags have not been to since 2008. Both teams will conclude not only this series, but the regular season tomorrow at Blair Field with the first pitch set for 2pm. DIG Box Office: Seth MacFarlane debuts acting chops on "A Million Ways to Die in the West"